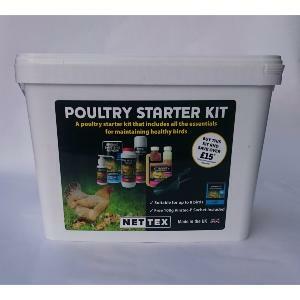 The Net-Tex Poultry Starter kit includes all the essentials for maintaining healthy birds. It is suitable for up to 8 birds and includes a free 100g sachet of Viratec-P. The products come neatly packed into a plastic container with a handle for ease of carrying. Would make a great gift or just a handy addition to a garden chicken keeper.